The rope access services that we offer, were born from the need to access structures and buildings by methods other than mechanical lifting or scaffold. 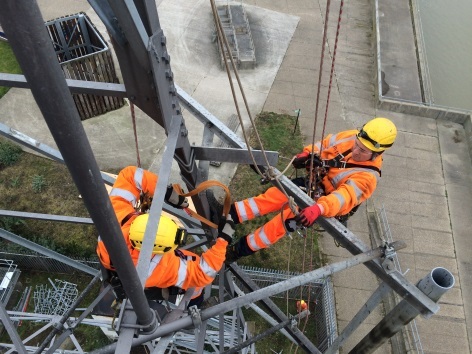 We have two teams trained in all aspects of access, rescue and pulley lifting systems, these teams are also highly skilled in steelwork and building work, so are able to complete any tasks whilst working from a professionally installed access system. We are now approved Vertical System Installers for Latchways Fall Protection products. Safety is paramount and we supply all necessary equipment and additional ground based banksmen to ensure the safety of our teams and the public. Our teams enjoy and thrive on the most difficult scenarios and will strive to deliver the safest quickest and most cost effective solution to your needs. For many jobs, the cost of providing access far outweighs the cost of the work to be done. We can carry out this work in most cases without the cost of scaffolding or hydraulic access platforms. We can complete the work in less time than it would take to erect a traditional access system. The equipment we use is highly mobile and lightweight, anchor points are selected for safety and suitability without damage to the structure. This means rapid deployment and removal. We can respond to emergency situations far quicker than deploying other methods to, make safe any damage to buildings and structures. On sensitive sites rope access can avoid unsightly scaffold allowing historic buildings to be accessed without spoiling the aesthetics for the duration of the work. In many cases, we can avoid costly road closures and by careful planning and out of hours working, avoid disruption to busy pedestrian areas and Shopping Centres.